A 'print renaissance' occurs at the school over the late 1920s and early 1930s, with a strong emphasis on linocuts, a medium that was popular with British artists at the time. Florence Akins is the first student to be awarded the newly instituted Diploma of Fine Arts by examination. Evelyn Page (Evelyn Polson) is appointed equivalent full-time Lecturer (1930–36). Professor James Shelley is appointed to staff (1931–36, Lecturer 1931), and as Director of the School of Art is admitted to the Professorial Board, resulting in the school's greater integration with Canterbury University College. From 11-16 July the School of Art celebrates its 50th Jubilee with a diverse, 200 work retrospective exhibition at the Armagh Street Gallery which includes work by current and past students and staff. Christchurch's first public art gallery, the Robert McDougall Art Gallery, opens in June, enabling the art students to view a greater selection of contemporary and historical works. Ivy Copeland is appointed to staff (1933–36). Following a period working as a full-time artist, former Director of the school Archibald F. Nicoll is reappointed as a lecturer (1934–45). Ivy Fife is appointed to the staff (1934–59). Florence Akins, the first student to be awarded the Dip.FA, is appointed to staff and becomes one of the school's longest serving staff members (1936–69). In 2006 she celebrated her 100th birthday. She initially taught the junior students, sending two girls across the road to the Botanical Gardens each morning to obtain plant cuttings from the gardener who selected seasonal specimens of particular interest. From drawings of plants, designs were developed for embroidery or paper repeat design work. 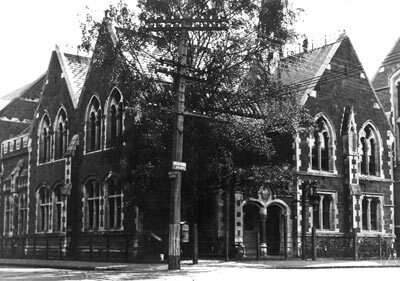 With the growth of the Junior School in the early 1930s, more students attend CCSA as a high school, and more teaching positions are made available for women. Generally women taught junior classes while older male staff taught tertiary or senior students. The junior school staff include the following lecturers: Florence Akins, who takes the junior students for plant study; Ivy Fife, lecturing in design, embroidery and plant forms; Herbert Horridge teaching Greek mythology and drawing, supplemented by Rata Lovell-Smith who also teaches English, civics, and Maori mythology; Louise Henderson takes embroidery; metalwork is taught by 'Johnny' Johnstone; a Mrs Jordan teaches the girls dressmaking; Francis Shurrock instructs the juniors in modelling, while Bill Sutton teaches them geometry and lettering. Senior teachers who occasionally teach the Juniors in 1939 include Cecil Kelly, Archibald Nicoll, and Richard Wallwork. With the outbreak of war in 1939, teaching is disrupted by the absence of staff serving in the armed forces. 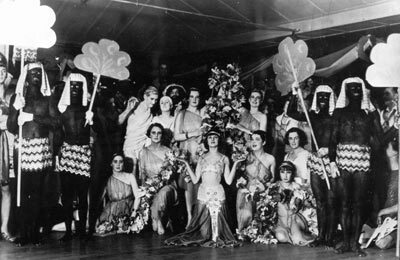 The 50th Anniversary Exhibition, Canterbury Society of Arts Gallery, Jubilee Week, July 11th, 1932. 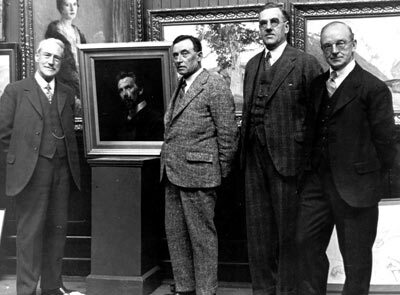 From the left is former Headmaster George H. Elliot; the portrait is of Elliot's successor Director Robert Herdman-Smith by Richard Wallwork; next former acting Director Frederick Gurnsey; former Director Archibald Nicoll; and Director at the time of the Jubilee in 1932, Richard Wallwork. The sculpture section of the School's Jubilee exhibition at the Society of Arts' Durham Street gallery featured work by students and lecturers. 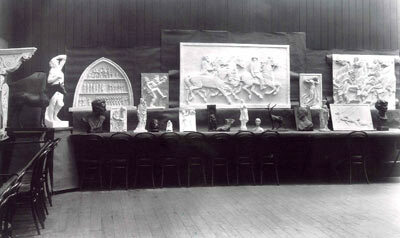 To the left is Elizabeth Harrison's painted plaster horse, Persimmon, a model of King Edward VII's famous race horse. Harrison was a student of F.A .Shurrock's in the early 1930s. Persimmon has been held by Harrison's family since her untimely death at the age of 25. 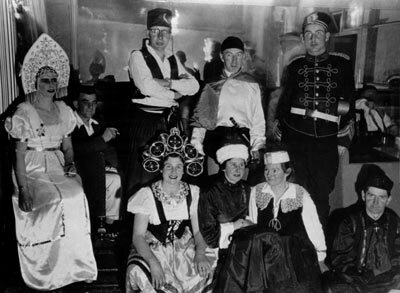 The annual Arts Ball was held at the Provincial Council Chambers, on the corner of Durham and Armagh Streets, from as early as the 1920s and continued until the 1950s. The Provincial Council Chambers was the chosen venue because it had a sprung floor and a Dance License. Former Christchurch Art Gallery Senior Curator, Neil Roberts, has identified the following people: Bill Sutton – standing far right, Owen Lee – kneeling right, Austen Deans – second from the left. The School's Gothic Revival buildings are in the background.